Congress isn't exactly the most welcoming place in the country for women — on a scale of lady friendliness, it probably falls somewhere between "NFL locker room after a big loss" and "XBox Live chatroom." Women in Washington are on their own, but for each other. And when they do find each other, they form the sort of bond that can transcend tragedy, distance, illness, and heartbreak. 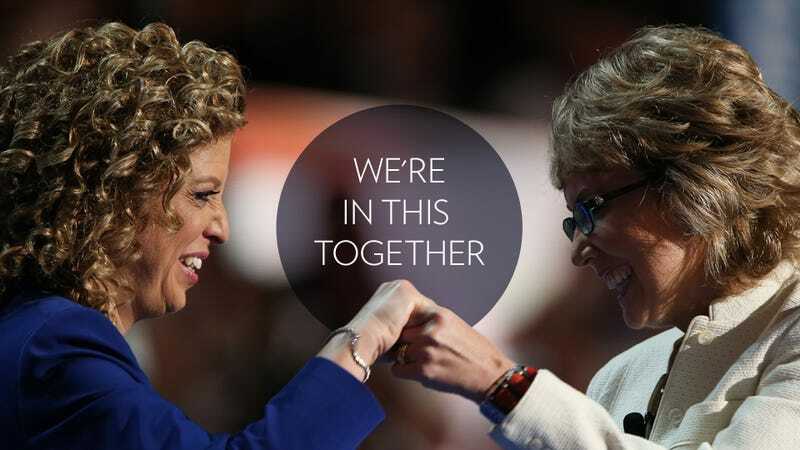 The sort of bond between Reps. Gabrielle Giffords and Debbie Wasserman Schultz. In January of 2011, Rep. Gabrielle Giffords was critically injured in a shooting that ended the lives of six people and injured a dozen more. When she appeared in public at different points during her incredible recovery, a few familiar faces continually appeared by her side — her husband and staff members, but also female colleagues from the House of Representatives. Most visible of those female colleagues was Florida Congresswoman Debbie Wasserman Schultz, who steadied her walk alongside her when she appeared at the State of the Union address, who through tears read Giffords' resignation letter aloud when the Arizona Democrat couldn't, and who stood with Giffords onstage at the Democratic National Convention when she recited the Pledge of Allegiance and made it rain tears on everyone's face. How do two women in the contentious world of Washington go from strangers to the sort of friends who would schedule trips around visiting the other in the hospital, the sort of friends who would trust the other with their voice? "In Congress, I wouldn't say you're among the wolves," Congresswoman Debbie Wasserman Schultz explained over the phone, "but women in Congress are the only ones who are really in it. It's very hard to explain what you're going through to other friends." In fact, it wasn't until early 2011 that women in the House of Representatives even had a bathroom anywhere near the House floor. Before its installation, the 76 female members of the House had to schlep through tourists into the nearest ladies' room, which was located off of something called the Lindy Claiborne Boggs Congressional Reading Room. Women comprise slightly more than 50% of the US population, but only 17% of Congress. It's a lonely road, being a younger woman working in Washington. The number of women in Congress is small, and the number of women 45 and under is even smaller — in a legislative body where the average age is around 57 and the average gender is male, it's hard to find peers, and in the Senate, Kirsten Gillibrand and Kelly Ayotte are the only women serving who were born after 1965. To build camaraderie among the elected women of the legislative branch, Wasserman Schultz and Republican Rep. Joann Emerson of Missouri co-captain the Congressional Women's softball team, where women of both parties play on the same side against a team of female journalists. Men in Congress have a corresponding baseball league, but they divide up by political party, and play against each other (read the partisan baseball divide as a symptom of an overly partisan, male competitiveness-driven Washington at will. But I digress!). The "we're in this together" mentality of women in Washington leads to some pretty powerful and lasting friendships. In 2005, Gabrielle Giffords was a state Senator in Arizona mulling a future Congressional run, and Wasserman Schultz was Florida's 20th District's newly elected Representative to the US House. Both women were invited to participate in the bipartisan Aspen Institute's inaugural Leadership Program, which invited promising leaders from around the country together for training (also present in that inaugural class — Paul Ryan and former GOP Chair Michael Steele. Weirdest room in which to be a fly on the wall ever?). The two women began chatting at symposium sessions, and when Wasserman Schultz's husband and Giffords' then-boyfriend Mark Kelly attended a session with their ascendant political better halves, the two men became fast friends. As Giffords' political career took off, Wasserman Schultz found herself in Arizona helping her campaign for Congress. By the time Giffords won her first term in Congress, the two women were more than just work friends; their families were friends. Giffords and her boyfriend turned fiancee turned husband Mark Kelly visited Wasserman Schultz and her family and their vacation home. They hung out during their time off. They commiserated about work, about family. On Saturday, January 8, 2011, Wasserman Schultz was about to drive her then-7-year-old daughter Shelby to a soccer tournament an hour away from her home when an email arrived on her phone. It was from an aide, and contained no text, no link to a news story. The subject line read GABBY GIFFORDS SHOT??? Wasserman Schultz began emailing, calling, texting, and checking her iPad for confirmation of what was going on. She turned on the radio, and before long, she heard the awful news, which was confirmed to her by multiple heartbreaking phone conversations and emails with colleagues. For the rest of the drive to the tournament, the Congresswoman attempted to juggle coping with a tragedy involving her friend, explaining to her elementary school-age daughter what had happened to her mom's friend Gabby. At the tournament, Wasserman Schultz paced back and forth along the sideline, distraught, constantly on the phone hoping for good news. Her staff was so worried about her that they sent her father and her campaign manager to pick her up and drive her home. Shelby stayed at a friend's house that night. That Wednesday, Wasserman Schultz, Leader Nancy Pelosi, Senator Kirsten Gillibrand, and President Obama flew to Arizona, where they attended a memorial service for the victims. After the service, the four went to Giffords' hospital room, where they held her hand and spoke to her. When Congresswoman Wasserman Schultz started talking, Giffords' eyes fluttered open. "It must have been my distinctive Long Island accent," she said, laughing. "She didn't expect to hear it." Giffords doctor said he didn't believe in miracles, but that the "power of friendship" — or, at least, the power of the incongruous regional accent — was pretty formidable. For the next year, Wasserman Schultz visited Giffords in the hospital (and later, the recovery facility) about once a month, scheduling her travels westward to include stops to see her friend. She was there to see Gabby ask for toast. She saw her learn to walk, and then speak again. When Giffords returned to Congress in August of 2011 to vote on increasing the debt ceiling limit, Wasserman Schultz met her at the chamber's carriage entrance and helped her walk to her seat. When Giffords returned for the State of the Union, Wasserman Schultz was there again to meet her and walk alongside her friend. And when Giffords formally announced her retirement from the House to focus on her family and her recovery back in January, she and her husband Mark asked Wasserman Schultz to read Giffords' words, as she wasn't yet able to speak. Up to the moment that Giffords made her triumphant trip across the stage at last week's DNC, Wasserman Schultz says she tried to be as supportive a friend as she could, someone to lean on. And you can tell by watching the two women that Wasserman Schultz is fiercely loyal to her friend. These women truly care about each other, like how female friends of any age and station care for each other — and sustaining relationships like that can make even the coldest, blackest hearts abandon cynicism. We all need to step away from it sometimes. "We all need girl friends," Congresswoman Wasserman Schultz explained, simply. Even Congresswomen.